Late Breaking explores the lives of characters inspired by the paintings of Alex Colville. 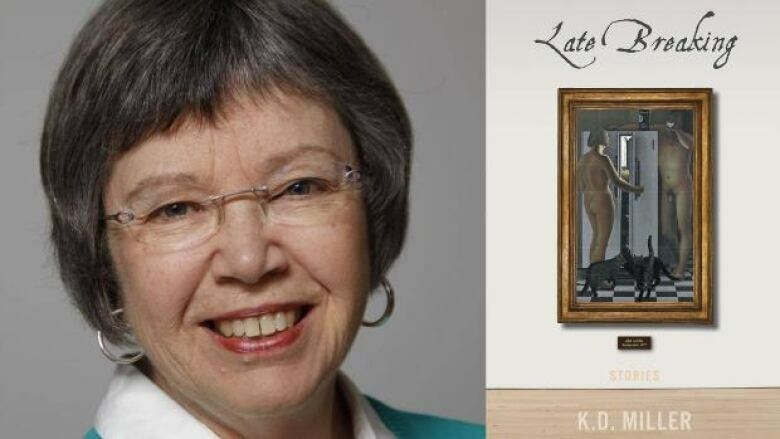 Late Breaking, the latest collection of short stories by K.D. Miller, is based on the art of Alex Colville. The collection centres on characters occupying Sackville, N.B. where Colville lived and taught for many years. The characters that Miller portrays are getting older and contending with a world that focuses predominantly on youth. "In 2014, I went to the AGO [Art Gallery of Ontario]. I saw the Alex Colville exhibit there and I had a real moment. I always liked Colville, but I hadn't really thought why, and I stood in the middle of the biggest dream looking at those paintings and a phrase came into my mind. The Colville stories, the Colville stories. It was like a mantra and I suddenly knew that I had my next book. I didn't know what it was going to be like, but I knew that I was going to use those paintings as visual writing prompts and just kind of pull stories out of them. "The first story that I wrote in the collection was Witness and it was inspired by a rather quiet little Colville painting called Woman on Ramp, which shows a white-haired woman, maybe in her late 70s. It was obviously Colville's wife Rhoda, who modeled for most of his paintings. She's in a bathing suit and she's walking barefoot up a wooden ramp away from what looks like a lakefront. I looked at that and I was very touched by it, and then I started to get a little nervous on her behalf. I thought, 'Wait a minute she is very frail, she is exposed, she is vulnerable; what if there's something in the cottage waiting for her?'" "Something that I wrote in my diary not too long ago was: 'I get the feeling I've been waiting all my life to be this age.' I'm 67 by the way. It's a terrific age and certain things just don't bug you anymore. You do get a sense of perspective. "I was aware of the negative feelings in our society towards aging, towards the old. They're not entirely negative, but we tend to marginalize seniors. There's a new phrase, 'a third age,' which I much prefer to 'senior citizen' because there's a sense of continuity there." "I didn't have a horrible childhood and my adolescence was no more torture than most people's, I would say. I just find that, maybe because I'm a writer, that [being older is] a more contemplative time. It's a time when you can slow down and take your time reading a book or writing. It's a good place to be now. That said, I'm very lucky. I have relatively good health, good friends and I have a good life." K.D. Miller's comments have been edited for clarity and length.